WHAT I'D DO IF I WON THE LOTTERY! What would I do if I won the lottery? That's a question I often ask myself; every day pretty much! Wouldn't it be bloody amazing to win the lottery though hey? I mean if I'm ever going to win it I need to buy the tickets more regularly *I think I've brought about 5 since I was 16 and I'm 23 now* but hopefully one day! If I won the lottery I'd definitely be one of those people that treated myself to the luxury items that I would never normally buy as well as treating my friends and family too. 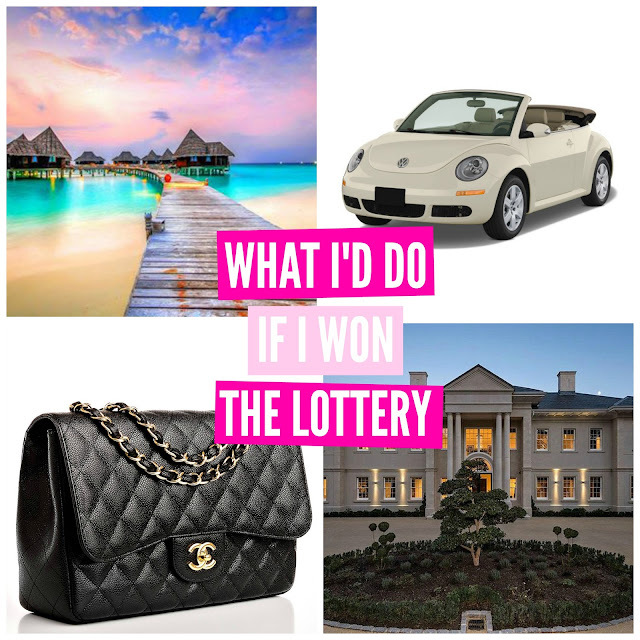 Today I'm going to share with you what I'd do if I won the lottery! Ok so first things first I'd 100% book a 5* all inclusive holiday for Jay and I to go to the Maldives. Like most people it is a dream to go to the Maldives one day where I can just sit on the white sandy beach, dip my feet in the clear blue crystal clean water and look out at the view from an infinity pool. It would be amazing. I'm one of those people who sits on pintrest lusting over these types of holidays so it would definitely be the first thing I'd do. I would buy a house for Jay and I. I'm 23 and not ready to buy my own house yet but if I came into some money I'd definitely buy one straight away. It'd be the dream house which would be a big country style house with splashes of modern interior and a huge pool. I've ALWAYS wanted a Chanel Jumbo handbag so I would definitely treat myself to one of those that I could instagram for days!! If you follow me on social media you'll know that I haven't passed my driving test yet but I have recently picked up the lessons again and this year I will pass once and for all. I would love to buy myself a beetle in cream or black because I think they're so cute and aren't too big so wouldn't be too hard to drive! It would be a dream to go self employed and combine my career with my blog. If you didn't already know I work in events management and would love to one day set up my own blogger events company so I can combine my passion for events with my passion for my blog. CHOCOLATE BARK RECIPE | I SURVIVED LENT!